Secretary-General António Guterres addresses a Security Council meeting on the situation in the Middle East. After over a century of hostilities including 50 years of continued military occupation, Israelis and Palestinians are still no closer to peace, a United Nations special envoy said on Tuesday, warning that even as many in the region have lost hope for positive change, the enemies of peace are growing more confident by the day. His comments echoed remarks by UN Secretary-General António Guterres who opened the meeting by underscoring his commitment to achieving two democratic States living side-by-side in peace. “This is a time for dialogue, for reconciliation, for reason,” the UN chief said, expressing concern that global consensus on the issue may be eroding. Mr. Mladenov reported on developments such as the need to maintain support for the UN agency assisting Palestinian refugees across the region, UNRWA, as it faces a substantial funding shortfall. He also spoke of the violence affecting both sides, including the killing of seven Palestinians by the Israeli security forces and the stabbing death of an Israeli civilian by a Palestinian in the West Bank. Mr. Mladenov also urged the international community to continue advocating for “substantial” Israeli policy changes related to the West Bank, including halting settlement construction there: something the UN considers illegal under international law. 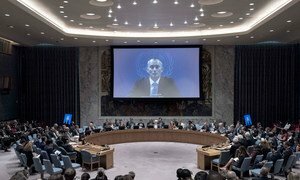 Nickolay Mladenov, UN Special Coordinator for the Middle East Peace Process, briefs the Security Council. “In this chamber, we have often spoken of the need for leadership on both sides to reach a deal, a compromise, through negotiations that would allow Israelis and Palestinians to separate and be master of their own fate. But these negotiations would not be negotiations between equals,” he said. Also addressing the Council, Palestinian President Mahmoud Abbas addressed concerns surrounding the status of Jerusalem, considered holy by both Jews and Muslims as well as Christians. He recalled the decision announced last December by United States President Donald Trump to recognize the city as Israel’s capital. “It did so ignoring that East Jerusalem is part of the Palestinian territory. It is occupied since 1967. And it is our capital open to all the faithful of the three monotheistic religions,” he said. Mr. Abbas described the situation of the Palestinian people as “no longer bearable,” and he called for an international peace conference to be convened this year as a means to find a solution to the stalemate. Israel’s representative to the United Nations Danny Danon also touched on the issue of Jerusalem, observing that the Palestinian leader had left the room prior to his presentation. “Let me be clear: for thousands of years, Jerusalem has been the heart and soul of our people. Jerusalem has been our capital since the days of King David and Jerusalem will remain the undivided capital of the State of Israel forever,” he said. Prior to the start of Tuesday’s meeting, ambassadors observed a moment of silence in honour of one of their former colleagues, Ambassador Vitaly Churkin of the Russian Federation, who died a year ago that day. The United Nations, the Security Council and the wider international community all have fallen into a pattern of “managing, rather than resolving” the Palestinian-Israeli conflict, the UN envoy on the Middle East peace process warned Thursday, saying it was time to end this paralysis, show political leadership and push for policies on the ground that rebuild trust.